Who is Responsible for the Destruction of Ganden Monastery? Republished in TPR with permission. When thinking about the Cultural Revolution, the scenes of Ganden Monastery laying in ruins are still vivid in our minds. For the past years, local people have been falsely identified as the culprits responsible for this. 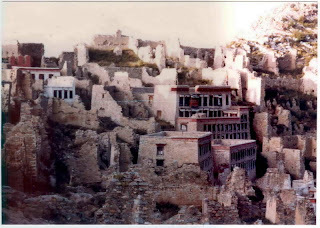 A few years ago, in order to gain an understanding of what really happened in Tibet during the Cultural Revolution, I took some photos that my Father had taken of wrecked monasteries, portraying the “forces of evil”, and went to visit over 70 elderly people who had been deprived of their youth by the Cultural Revolution. Only after I listened carefully to their unbelievable stories and experiences, did I start to fully understand the actual facts. But why does the trail go dead? What did the army do that must not be exposed? Of course, it is yet another dubious case and Tibetans can do nothing but suffer in silence. 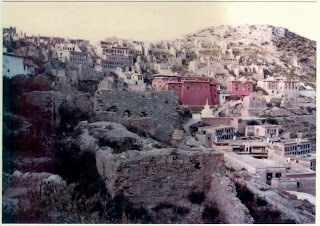 On the internet we find a report by a journalist from official state media, introducing how Ganden Monastery was revived; it states that “due to the chaos of war, natural disaster, and ‘ten years of Cultural Revolution’, Ganden Monastery was heavily damaged. (...) After 1978, the country carried out large-scale restoration work. The monastery’s monks also raised resources themselves to support the maintenance work.” The report also lists the exact numbers of the different kinds of funds that the local authorities invested in the restoration project. It sounded as though the damage inflicted upon the monastery was an inevitable scenario and that the so-called “state” has always been a tremendously generous benefactor. But in “Old Tibet”, before ruthless liberation, there existed more than 6000 monasteries in the whole of the Tibetan areas and then, after numerous revolutions, only about 10 of them were left. Although today, most of them have been restored, their scope cannot at all be compared to the ones in the past. It needs to be remembered that the restoration efforts by the “state” have been lacking far behind the efforts of the Tibetan people. Every time a monastery was plundered, during its rebirth, Tibetan people devoted a pious confession of sweat and tears and engraved this piece of land, including its living beings and the six relams of transmigration with a spirit of resistance against treacherous powers.